We left Death Valley on October 18th, and traveled to the Inyo National Forest in the Sierra Nevada Mountain Range. We had gotten an early start so we were not traveling in the heat of the day through Death Valley and arrived at the Oh! Ridge campground in the early afternoon. 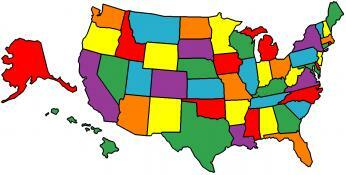 Compared to our earlier camping in the desert outside of Las Vegas and in Death Valley, Oh! Ridge was a big change. First, it had trees! Not as many as you would have in a typical Michigan campground, but far more than we had seen lately, and it was at 4,000 feet above sea level. Our campsite was beautiful with a terrific view of June Lake. We spent the afternoon sitting in the sun, reading, and enjoying the view. Friday we rode our bikes into town to go to the post office, the hills made the ride quite a challenge! 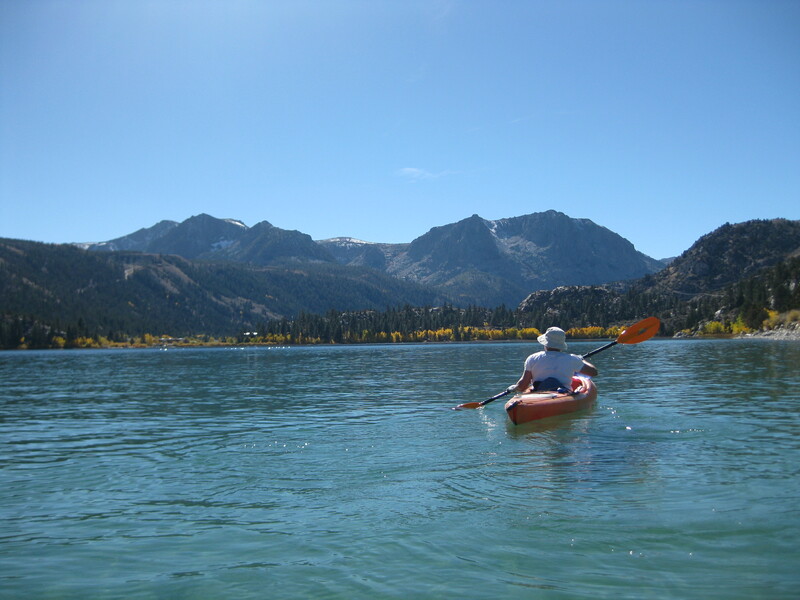 It was such a beautiful day we kayaked around June Lake. Even though it was October 19th, the weather was so nice it felt like a summer day. 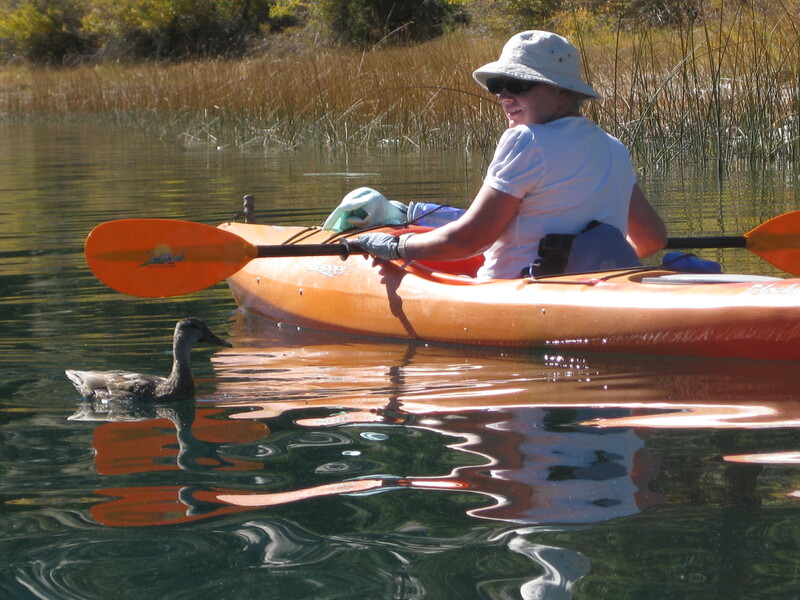 The water was as clear as tap water and the ducks were so used to people they would swim right alongside of our kayaks. We stopped at a local marina and then walked to the local candy store for ice cream cones. About ten miles north of June Lake is Mono Lake which has the same characteristics as the Great Salt Lake in Utah. 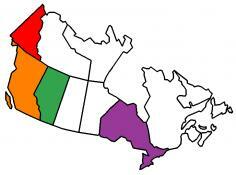 It is fed by streams and rivers but doesn’t discharge it’s water anywhere, except by evaporation. As a result the salt and other minerals remain. The salt content of Mono Lake is three times saltier than the Pacific Ocean. Mono Lake is a stopover for many migratory birds, some of whom travel as far as Brazil and return each year. Bob found Mono Lake to be an interesting story of progress and development versus conservation. In the 1970’s Los Angeles purchased land in the mountains around Mono Lake and built aqueducts to divert water from the rivers and streams to Los Angeles. As the population of Los Angeles increased, the amount of water diverted also increased and Mono Lake started to dry up. Finally David Gaines, a local citizen, started a committee to challenge Los Angeles’ actions. Eventually the U.S. Court decided that Mono Lake had to be maintained at a minimum level for the maintenance of the lake, protection of wildlife habitat, and the water needs of the local communities. This effort is ongoing today and the lake levels are rising. 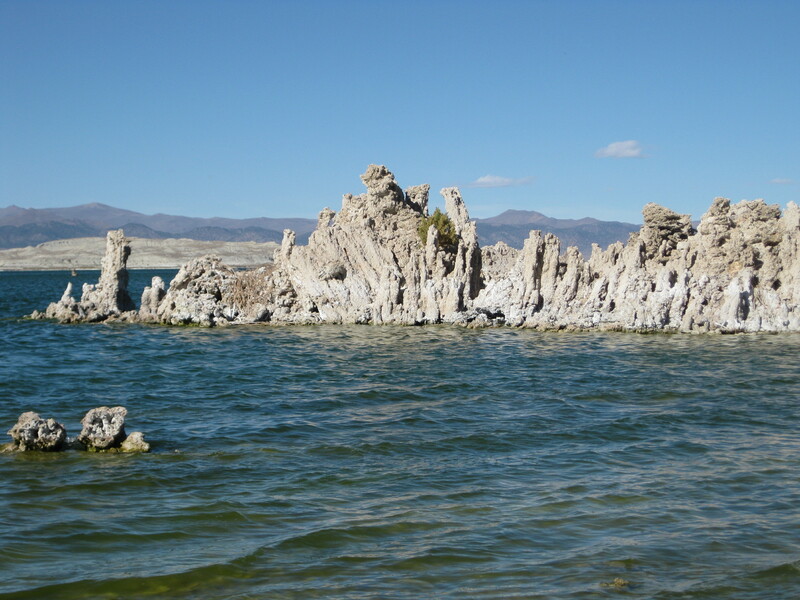 One of the interesting geologic features of Mono Lake are the Tufa. These are created when the fresh water springs, rich in calcium, bubble up through the carbonate-rich lake water. The calcium and carbonates react to form calcium-carbonate salt deposits which are called Tufa. This solid, limestone-like material continues to develop, forming vertical towers with the spring water percolating up through them. As the lake receded in the 1970’s, these Tufa became visible. When we planned this stop, we had intended to go to Yosemite National Park. However, our Mountain Driving Guide had stated that the tunnels in the park did not have enough overhead clearance for our trailer – this is why we decided to stay at Oh! Ridge. Our revised plan was to spend two days at Yosemite (leaving the trailer at Oh! 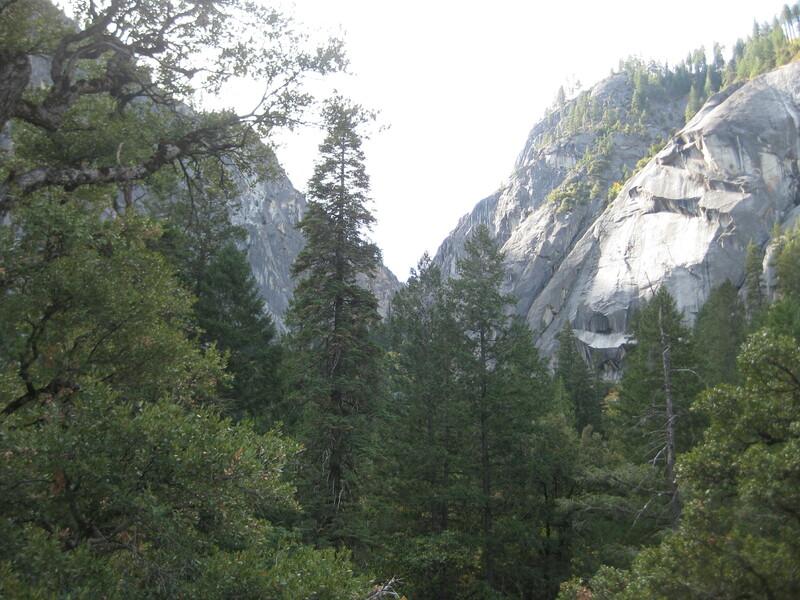 Ridge) and stay overnight at the Wawona Hotel near the Mariposa Grove of giant Sequoia trees at the south end of the park. Based on weather reports we made our reservation for Sunday night, because the forecast was for rain late Monday-early Tuesday. We visited the Interagency Visitor Center at Mono Lake just north of us near the town of Lee Vining to more information on Yosemite. When we spoke to a Ranger about our plans she warned us the storm forecast of rain, with snow in the mountain passes, had been moved up to Sunday night instead of Monday night. That might close the Tioga Pass on Route 120 into and out of Yosemite. She advised us to go right away and return on Sunday. We knew we couldn’t get a room at the Wawona that night and decided to take our chances the next day. Sunday we were up before sunrise to get into Yosemite as early as possible. 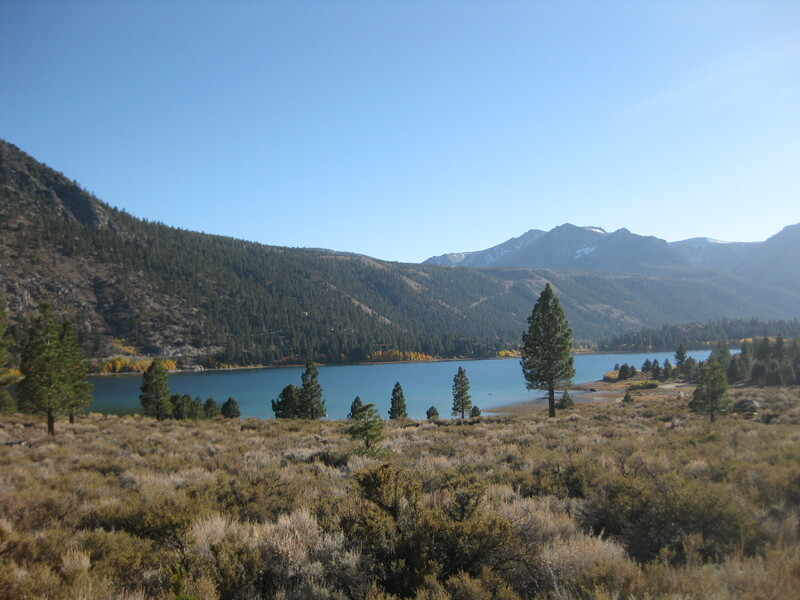 As we drove through the Sierra Nevada Mountains we were struck by their beauty. The downside was while Pat was admiring the scenery, Bob had to keep his eyes on the road. 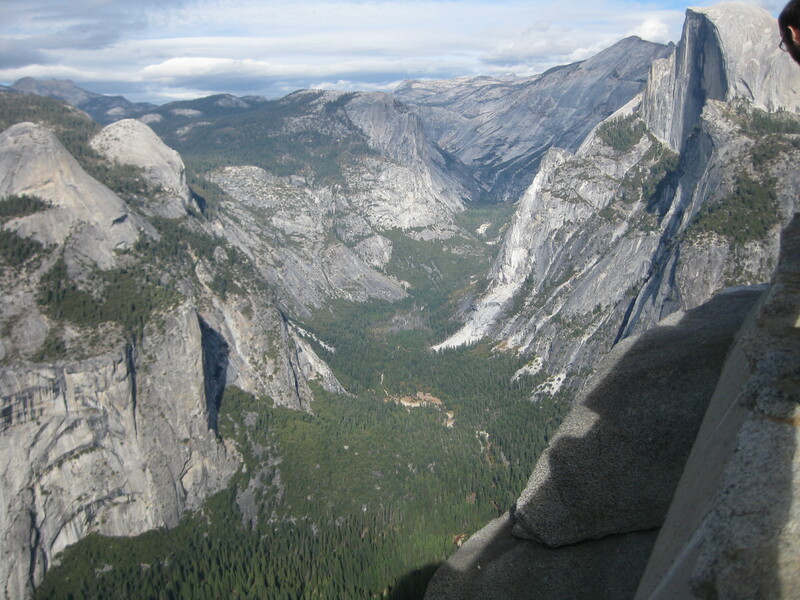 Yosemite Valley is just a beautiful sight. 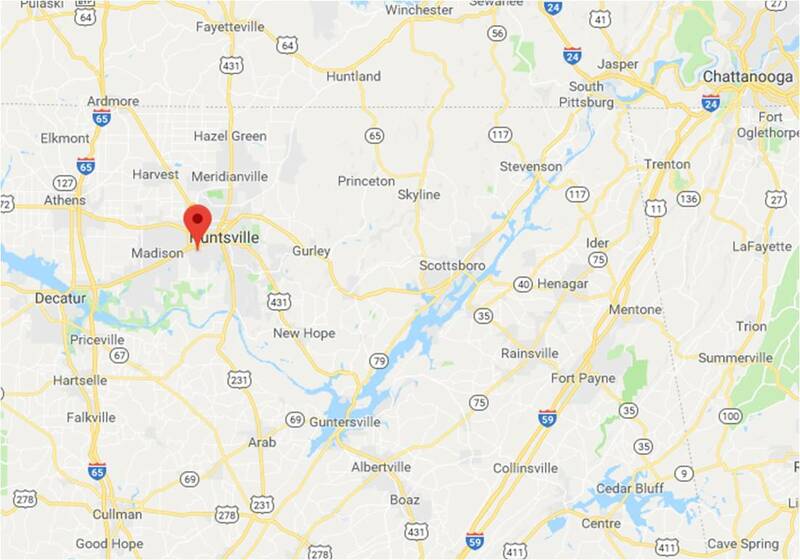 The cliffs that form the valley walls are impressive and the valley floor is lush forest and meadow, quite a change from the desert canyons of Bryce, Zion and Grand Canyon. 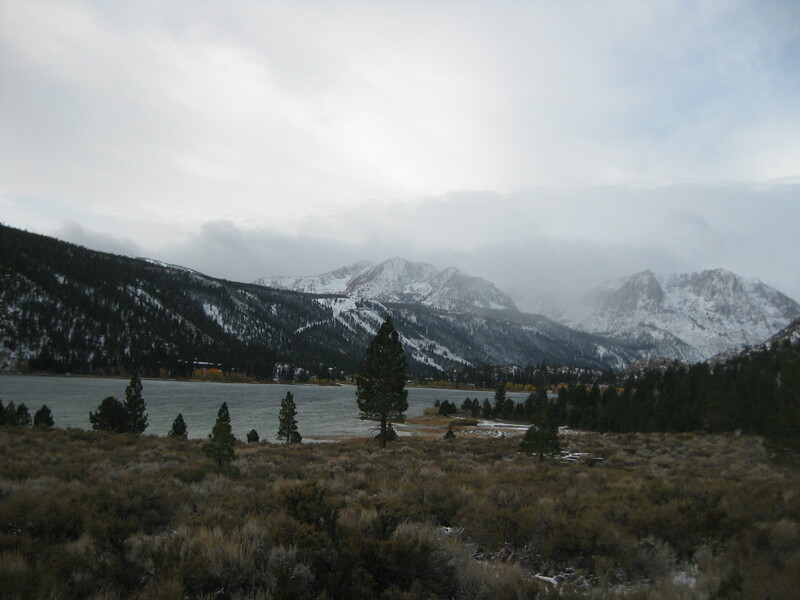 Because we were concerned about the weather closing Tioga Pass we covered a lot of ground in a short period. By a combination of shuttle bus, hiking, and driving we were able to see El Capitan, Half-Dome, the Cathedral Rocks, Bridal Veil Falls, and others. We hiked back into Yosemite Falls and while the view was great there was no waterfall – the source of Yosemite Falls dries up in late summer, so at this time of the year you can only see the site of the waterfall, not the waterfall itself. The Ranger at the visitor center had told us the “must see” sights included the Tunnel View and Glacier Point, as well as the Mariposa Grove. It was great advice! 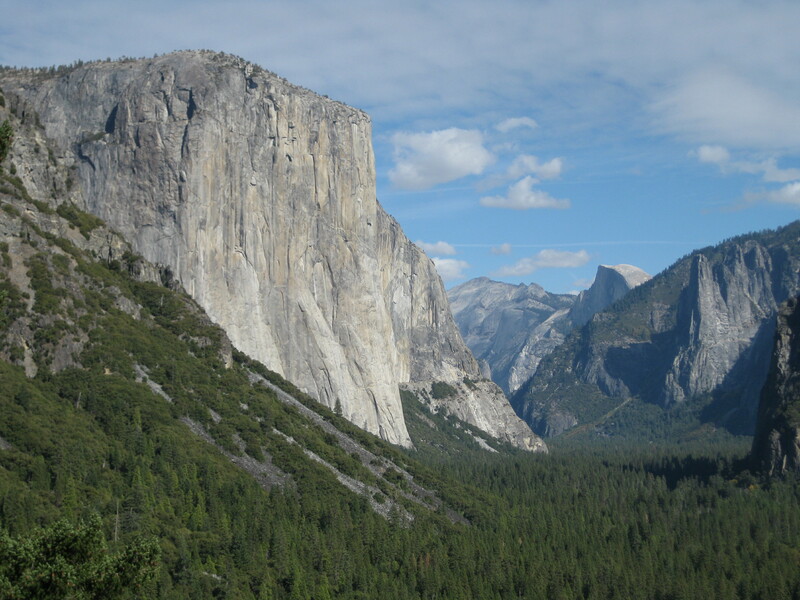 Tunnel View gave us a whole different perspective of El Capitan and Half-Dome than we got from the valley floor. Glacier Point was awesome! You could see almost the entire Yosemite Valley from there, sights we saw on the ground we could now see from an “aerial” view. It was late in the afternoon when we drove to the Mariposa Grove of Sequoias. According to our Ranger, this is the best grove of Sequoia trees in the park. We thought we would see a small collection of sheltered trees, but it was a forest full of them, one large Sequoia after another. As we walked the trail through the grove we learned how the Sequoia trees are managed. As with every other forest we have visited, fire is an essential element for healthy growth – fire clears the underbrush and unleashes seeds from the Sequoia acorns. Of the many trees we saw in the grove, two stand out. The largest Sequoia in the grove is the Grizzly Sequoia and it is estimated to be 1,800 years old. It is 96 feet in circumference and 28 feet in diameter at the base. 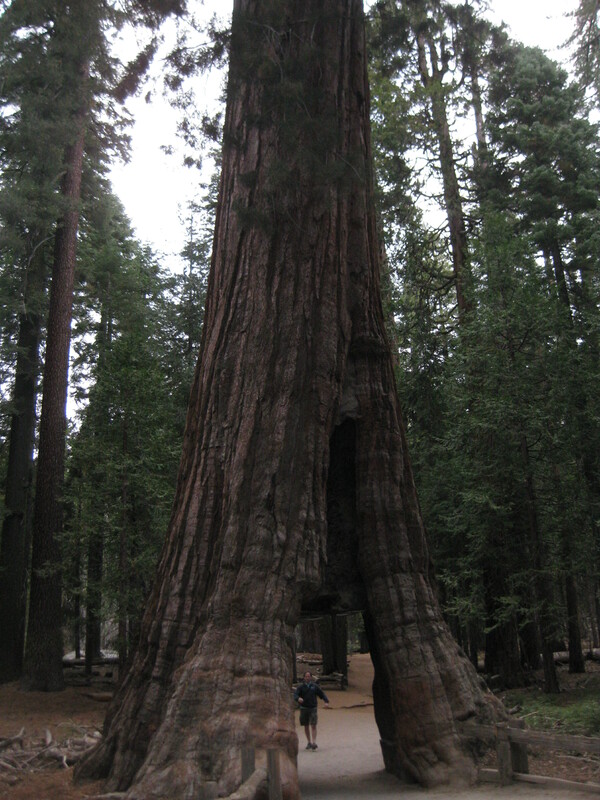 One of its limbs is seven feet in diameter, larger than any other non-Sequoia tree in the grove. The second is the California Tunnel Tree. In 1895 this Sequoia had a tunnel cut through its base wide enough to allow horse-drawn carriages to drive through. This is actually the second Sequoia to have a tunnel cut through it. The Wawona Tunnel Tree was tunneled in 1881 and fell over after a record snowfall in 1969. It was starting to get dark when we left the Mariposa Grove. We went to dinner in the nearby town of Fish Camp and checked into our room at the Wawona Hotel. This is a historical hotel, initially constructed in 1879. We had purchased the historical package which meant we had to use a communal toilet and shower. Little did we know that the facilities were not down the hall as we expected, but we had to go outside, and around the porch to the back of the building. Fortunately the hotel provides all guests with warm bathrobes! The next morning we were up early, had breakfast at the hotel, checked with the front desk and were informed that Tioga Pass was reported as open with no restrictions. With this good news we were on our way. Unfortunately, it took us about an hour and a half to get to the pass, only to find that it had closed since we left the hotel. Now the fun began. In order to get back to our trailer, we had to cross over the Sierra Nevada Range. There are other passes over the mountains, but they could be closed as well. We headed north toward Sonora and Placerville and when we got cellular coverage Pat called the California Department of Transportation hotline. We quickly found out our next option, Sonora Pass on Route 108 was already closed, then we found out that the next one, Ebbetts Pass on Route 4 was closed as well. 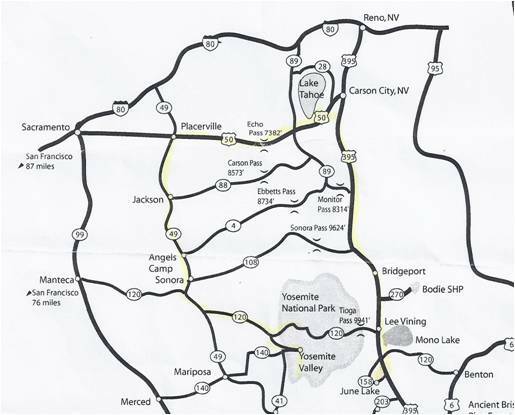 Shortly after that we found out our third option, Carson Pass on Route 88 had been closed. The hotline suggested that Echo Pass on Route 50 was still open, but you had to have tire chains or a four-wheel drive vehicle with snow tires on all four wheels. We had four-wheel drive and good tires, but they were not snow tires. As we drove into Jackson, CA we saw a sign for a California Highway Patrol station and stopped in. Thankfully we were told we would meet the requirements with our vehicle and we just hoped Route 50 stayed open. 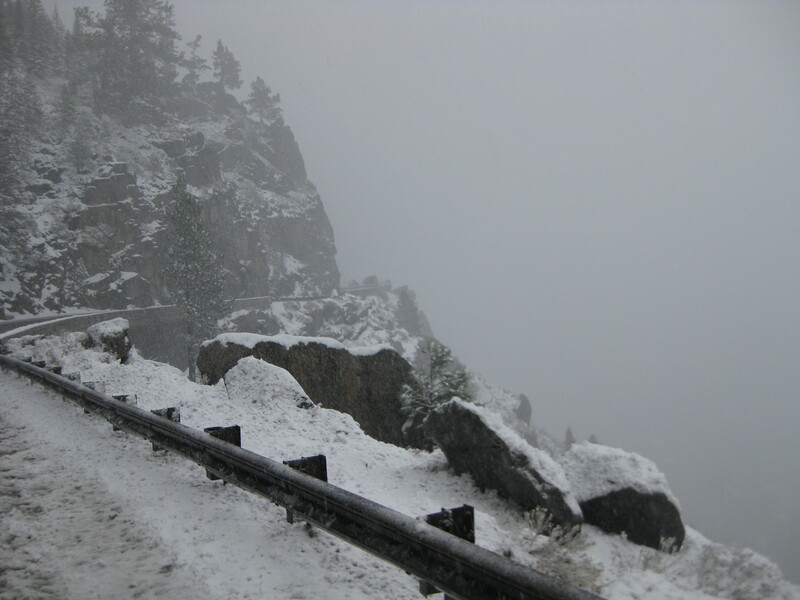 The higher we got in elevation, the worse the driving conditions became. There was blowing wet snow and at least an inch of slush on the road. This was nothing that we had not been used to in Michigan, but there you didn’t have a 7,000 foot mountain to slide off. Finally, about 4:00 PM we were over the mountain range and headed back south toward the campground – we had been driving since 8:00 that morning. From there on it was relatively smooth sailing and we got back to the trailer by 5:45 PM, what should have been a three hour drive (108 miles) turned into over eight hours and 340 miles! The next morning we woke up to 310 temperatures and snow on the ground. We decided to head to lower altitudes and warmer weather, so we packed up and headed to our next planned stop, Tuttle Creek Campground, near Lone Pine, CA. 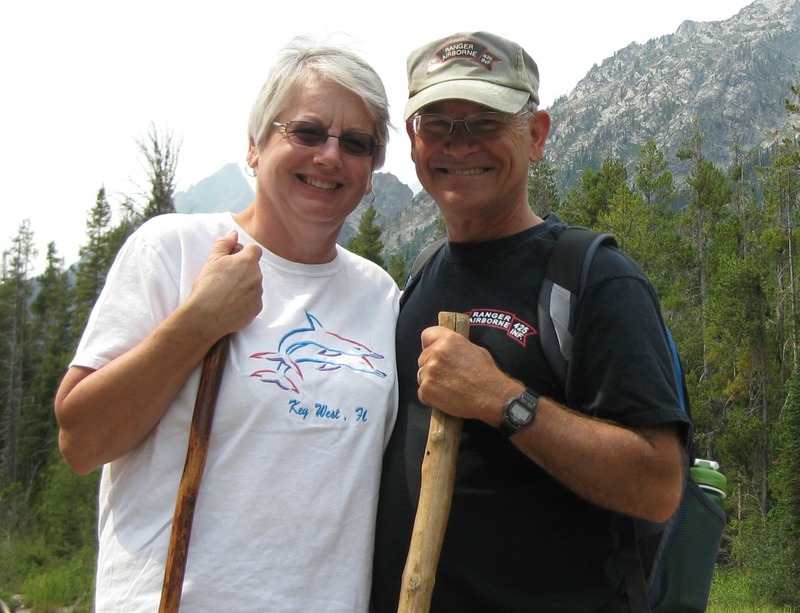 This entry was posted in California, Fulltime RV, Michigan Traveler, National Parks and tagged Giant Sequoia, Glacier Point, June Lake, Mariposa Grove, Mono Lake, Oh Ridge Campground, Wawona Hotel, Yosemite National Park. Bookmark the permalink. 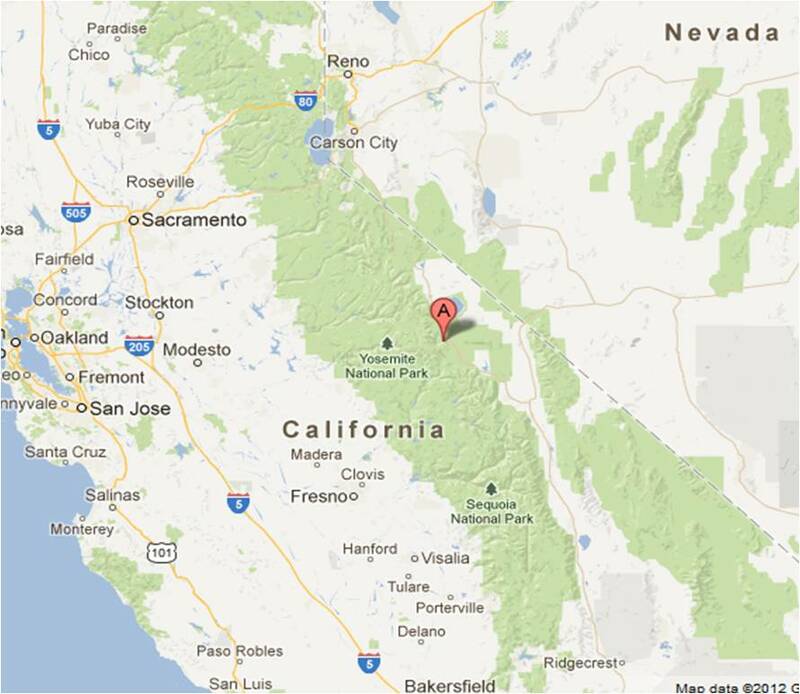 The entire Sierra Nevada Mountain range is so appealing to us. I would like to go back to the Alabama Hills again and do more hiking around the area. The Inyo Recreation campground at June Lake was one of the nicest we saw in the area.